This is one of the funniest videos I’ve seen in a long time. McCain replied, “Well, I don’t want him to be president, either. I wouldn’t be running if I did. But,” and he paused for emphasis, “you don’t have to be scared to have him be President of the United States.” A round of boos. The attacks and rhetoric we’re seeing from the McCain-Palin camp now goes far beyond run of the mill gutter politics to something far more dangerous. Campaign events for McCain & Palin look more like KKK rallies with shouts to “kill him“. They’re tapping into seething racism to fire up the base. Meanwhile, Sarah Palin and her husband have been involved with a genuine terrorist organization, the Alaskan Independence Party. If McCain had one shred of decency, he’d denounce these verbal attacks and tell his supporters to show some respect for Obama. 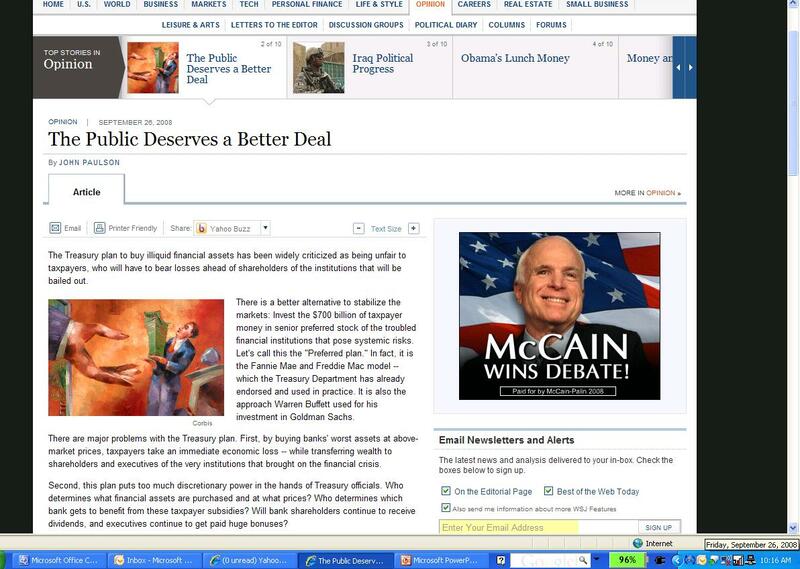 This is why McCain must not be our next president. An erratic hothead like him would be even more dangerous than Bush. If they weren’t Muslims, it would be all over the news and it would certainly be called a hate crime. The attack is widely believed to be inspired by a terror scare DVD being distributed by a pro-McCain group. Although tonight’s debate hasn’t happened yet (and until just recently it wasn’t certain that it would take place), McCain’s campaign is already running an ad saying they won the debate. Whenever I watch an interview with Sarah Palin I feel like I’m watching a slow motion train wreck. She actually makes Dan Quayle seem intelligent and articulate. When McCain picked her, I lost what little respect I still had for him. There has to be more qualified people he could have picked. Choosing Sarah Palin was one of his most transparent political moves. WTF? Shouldn’t the president be capable of doing more than one thing at once? I guess it might cut in to his nap time.